I know, we just made it through Thanksgiving, but Christmas and all those other big winter holidays are just around the corner! Hurry up! Get that living room cleaned up and start on your next grocery list! And don’t forget a list for the wine shop. Have no fear, over the next few days The Bubbly Professor will have some tips for your next holiday feast, whether it centers on glazed ham, beef tenderloin, or rack of lamb. We’ll even consider the vegetarians who roam freely amongst the meat-laden festivities. Click here for suggestions on wines to pair with roast turkey. Keep reading to pair wine with holiday ham. If your next big, crazy holiday gathering is going to feature a big, juicy holiday ham, the centerpiece of your meal will probably be glazed with maple or pierced with cloves. On the side, you are likely to find the standard line-up of holiday buffet dishes, including scalloped potatoes, sweet potatoes, brandied peaches, and green beans. Your first wine pairing guideline is to keep your wine choices centered around white wines, rosés, or lighter styles of red, so as not to clash with the inevitable sweetness on your plate and to avoid overpowering the entrée. As usual with holiday feasts, the array of side dishes offer up a wide variety of tastes and flavors, so our challenge is to find a wine that doesn’t wrestle with the rest of the meal. Follow these rules to a great holiday match! Rule #1 – Keep it Light to Medium Bodied – A meal based on ham will need a light to medium bodied wine in order to not overpower the main course in terms of both weight and flavors. For best results choose a sparkling wine, a white wine, or a rosé. If you just must have a red wine, keep to the lighter styles; Beaujolais and Pinot Noir are great choices, but this is not the time to whip out the Earthquake Zinfandel (however much I love it)! 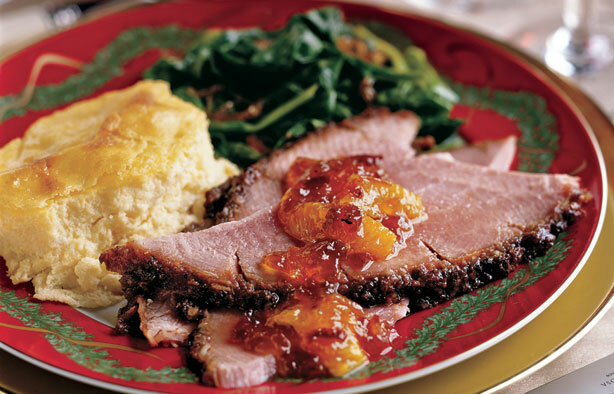 Rule #2 – Choose a Wine with Lots of Fruity Flavors – A dinner based on ham will most likely contain a side dish based on peaches, raisins, or sweet potatoes. While it is very hard to predict flavor-based reactions in wine and food pairings (as opposed to taste-based, which can be predicted quite accurately), fruity flavors in food will often make your wine seem less fruity. In order to avoid a fruit-on-fruit wrestling match and ending up with insipid-tasting wine, make sure the wine has fruity flavors to begin with. Rule #3 – A Wine with a Touch of Sweetness will be a great match, especially if your Ham is Honey-Baked or Brown Sugar-Glazed. This is important: sweetness in food makes wine taste less sweet and more acidic. 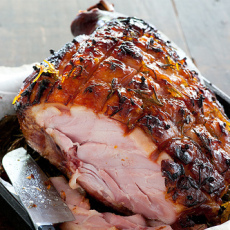 So…if your ham is coated with a sugary or sweet glaze, this rule cannot be ignored! 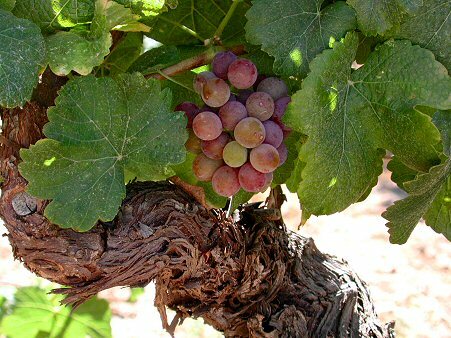 Don’t worry about having sweet wines on the dinner table ….the sweetness in the food will make the wine taste dry. Trust me on this one! Besides, don’t forget that your open-door policy on holidays most likely means that your guests have a broad range of preferences in wine, and this is one case where the Moscato drinkers and the sweet wine lovers may just have an edge. Hey, a few bottles of Moscato d’Asti and Brachetto d’Acqui never hurt anybody! Rule #4 – Choose a Wine with Moderate Amounts of Alcohol – This is a good rule on many levels. For one, ham usually contains a good deal of salty flavors. And, the sad fact of the matter is that salty flavors can clash with the taste of alcohol, as well as with high tannin wines, which is the reason behind the moratorium on heavy reds. And don’t forget that high alcohol wines can lead to drunken holiday family feuds, at least in my recent experience. Rule #5 – If You Like Spicy Foods, Match Spice for Spice – If you like spicy flavors in your holiday ham, you can build a flavor bridge by pairing your dinner with a wine with natural spice flavors. As mentioned earlier, the result of flavor pairings are hard to predict, but generally spicy flavors in food and wine enhance each other. For a spicy feast, try a Riesling, a Gewürztraminer, or a Rosé made from Sangiovese. Riesling from Alsace, Germany, or Washington State…for the wine adventurer, try finding a single winery that offers wines in varying levels of sweetness. Tasting them along with the meal will make for an interesting feast! Vouvray, either sparkling or still, or any other Chenin Blanc-based wine from the Loire. Rosé…just about any Rosé would be lovely, and this might be a time where Rosé d’Anjou with its slight hint of sweetness will absolutely shine. A rosé made from Sangiovese, which to me always seems to have a charming little hint of baking spice in the flavor would also work. If you have a rich uncle, tell him to bring Domaine Tempier Bandol Rosé, and save a bottle for me! 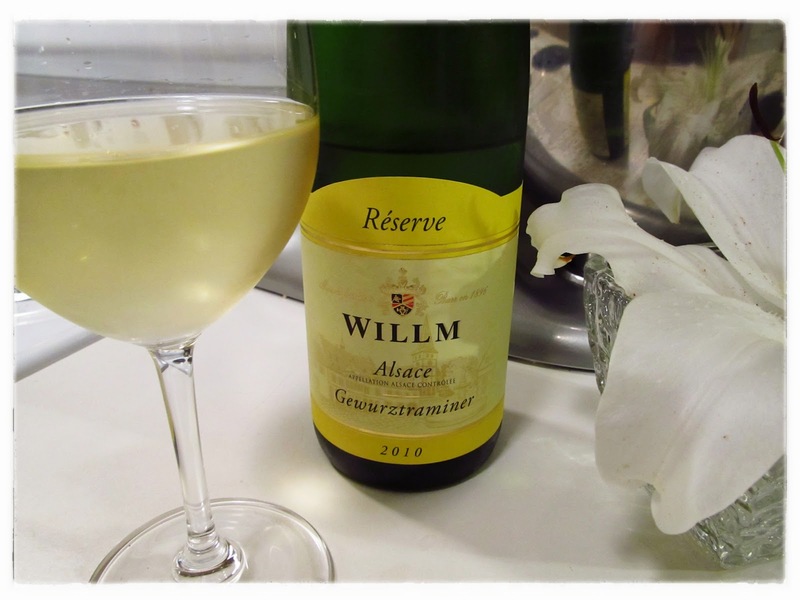 Pinot Gris from Alsace or Oregon – this is an under-appreciated wine if ever there was one. For less than $20.00 a bottle, grab a bottle of Adelsheim Pinot Gris from Oregon’s Willamette Valley. For a bit more dough, try just about any Pinot Gris from Alsace – I guarantee you will love it! 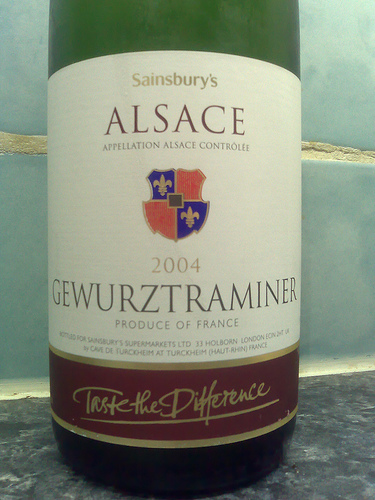 Gewürztraminer…my favorite “love it or hate it” wine will really shine with the flavors of a holiday ham feast. Germany and Alsace make terrific dry varieties, and some of the versions from California have a slight hint of sweetness. Rosé Champagne might just be the perfect choice. Go for broke and load up the table with Laurent Perrier Brut Rosé, or buy Cristalino Cava Brut Rosé by the case (at around $6.00 a delicious bottle you can afford it.) 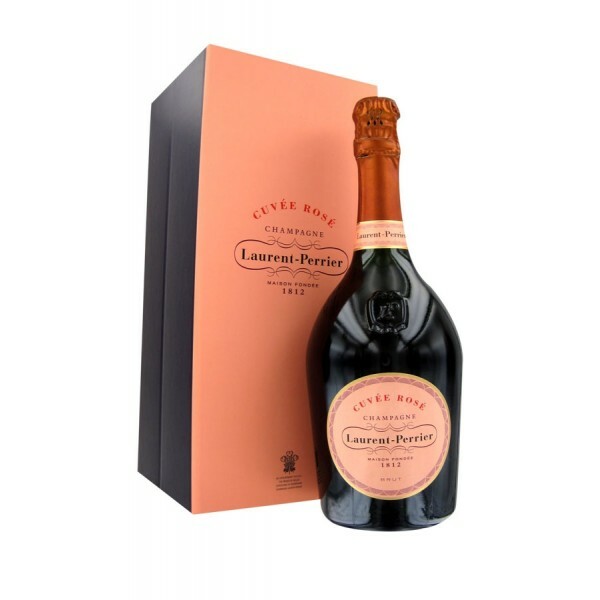 Or, buy the Cava for your guests and keep a secret stash of Laurent Perrier in the bedroom mini-fridge just for you and your bestie. Prosecco is a good choice, but then it just about always is! For the wine adventurous…try a Cabernet-Franc based red wine from the Loire, such as Chinon and Bourgueil. Red Burgundy, Cru Beaujolais or Oregon Pinot Noir. You just can’t go wrong with these food-loving wines. Barbera d’Asti, Dolcetto d’Alba, or a nice Chianti. Sure to please the lovers of earthy red wines. For the sweet wine aficionados in the crowd, grab a few bottles of Moscato d’Asti and Brachetto d’Acqui. These sweeties will work for the whole meal from spiced cashews to pecan pie! Remember to relax and enjoy the holidays, and don’t stress over the wine choices. Choose something you love and something that your guests will be comfortable with, whether they be wine newbies or wine adventurers! My last post – The Gewürztraminer Cheat Sheet – had me thinking about food pairings with Gewürz, which always leads me straight to French Onion Soup. I rarely make soup at home as my anh (adorable new husband) has a sort of primordial dislike of soup as a meal or even a starter course, as if it somehow pre-empts genuine sustenance. 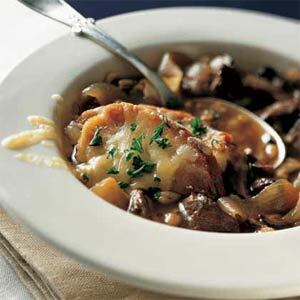 French Onion Soup is one of the few he can abide, and certainly a dish we can agree on. Obviously, with all this talk of French Onion Soup (and the accompanying Gewürztraminer), I just have to make it for dinner tonight, so thought I’d share my recipe with you. There’s one rather odd caveat about this version of the soup. When we first got married and were still trying to figure out how to care for and feed each other, the anh mentioned he loved French Onion Soup but hated how hard it was to eat. I had to agreed that I had been put off by stringy versions myself, so this recipe is custom-designed to avoid crouton-cracking splashes and stringy cheese arm-stretches. I used to think such accommodations were silly, but as a Chef Instructor one of the things I have learned to teach my students is that a fanciful presentation or even delicious flavor cannot make a customer enjoy a dish that is awkward to eat. 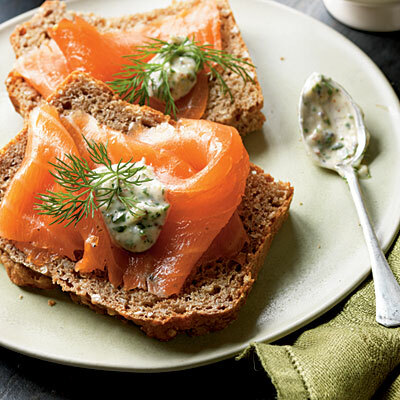 Makes four appetizer, or two main course, servings. 1. First of all, make the croutons without too much drama. I like to cut the bread into one-inch cubes – that’s part of the “easy to eat” platform. Simply spray (or toss) them with olive oil, place on a flat cookie sheet, and bake at 350 degrees for about 15 minutes. Give them a quick toss, and continue baking until they are golden brown. After they cool, wrap them in several layers of aluminum foil. They will keep indefinitely. 2. For the non-string-inducing cheese topping: Mix the finely grated Gruyère with the finely grated Parmesan, set aside. 3. In a large stock pot, melt the butter and add the olive oil. Add the onions and season with 1 – 2 teaspoons of salt. Cook over medium heat for 10 minutes, then stir. Add 1 teaspoon of sugar, reduce the heat and cook for another 10 minutes at low heat. Add the garlic. Continue to cook the onion/garlic mixture for 40 minutes or longer, stopping to stir the mixture and check for browning every 10 minutes. Cook until they onions are very soft and a deep golden brown. 4. Add the flour, thyme or oregano, bay leaves, and pepper. Stir over medium-high heat for two minutes. 5. Add the wine, stock, and water. Stir until the mixture simmers, then allow to simmer, uncovered, for 30 minutes. Check back and stir the mixture every 10 minutes. 6. Remove the Bay leaves, and give the soup its final “zing” by adding a generous Tablespoon of Sherry Vinegar. 7. When ready to serve, heat the soup to a simmer and divide among two or four bowls. Spread a pile of croutons out over each bowl, and top with your finely grated cheese mixture. Broil until the cheese is melted and bubbly, and serve your “easy to eat, non-string-inducing” delicious French Onion Soup with a chilled glass of Gewürztraminer. Enjoy!